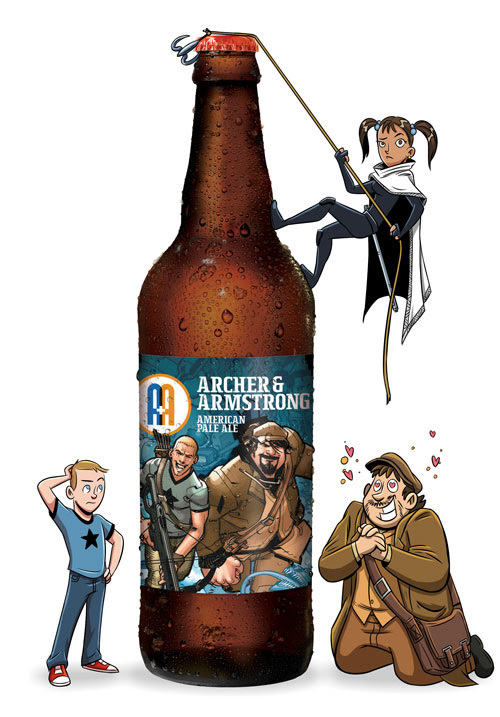 [vc_row][vc_column][vc_column_text]Valiant and Arcade Brewery Announce ARCHER & ARMSTRONG AMERICAN PALE ALE – Debuting at C2E2 2016! 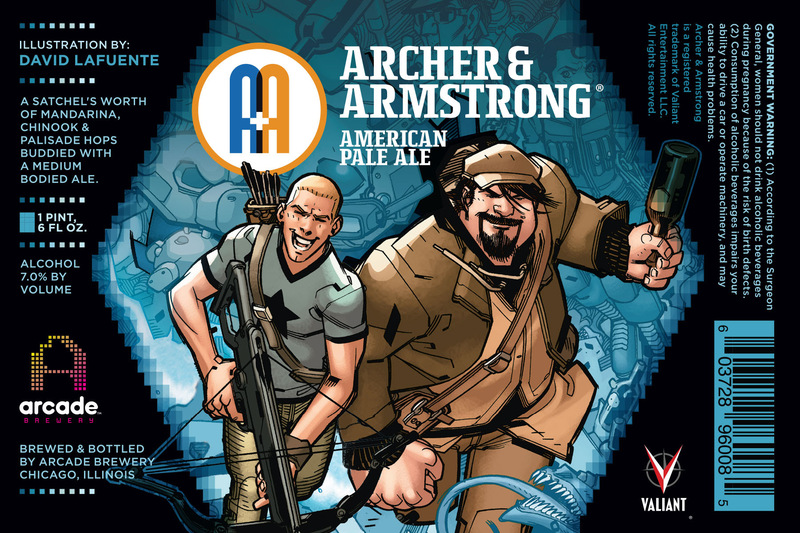 Valiant Entertainment and Chicago’s own Arcade Brewery are proud to announce a first-of-its-kind collaboration for Archer & Armstrong American Pale Ale – a refreshing craft APA set to debut this March during C2E2 2016! Just as Valiant’s award-winning adventurers prepare to mount a star-studded return with an all-new ongoing series in A&A: THE ADVENTURES OF ARCHER & ARMSTRONG #1 this March, Valiant and Arcade are gearing up to unveil a delectable new libation inspired by comics’ premier pair of history-shattering heroes and their upcoming journey into the infinite reaches of Armstrong’s bottomless satchel! One’s an immortal libertine with a lust for the finer things, the other is a teetotaling ex-assassin with a heart of gold…and now Arcade is perfectly embodying their dysfunctional partnership with a medium-bodied ale like no other! Hopped with Columbus, Chinook, Palisade, Cascade and Mandarina, Archer & Armstrong American Pale Ale builds on a light malt profile to create a complex and wonderful citrus/tangerine character. 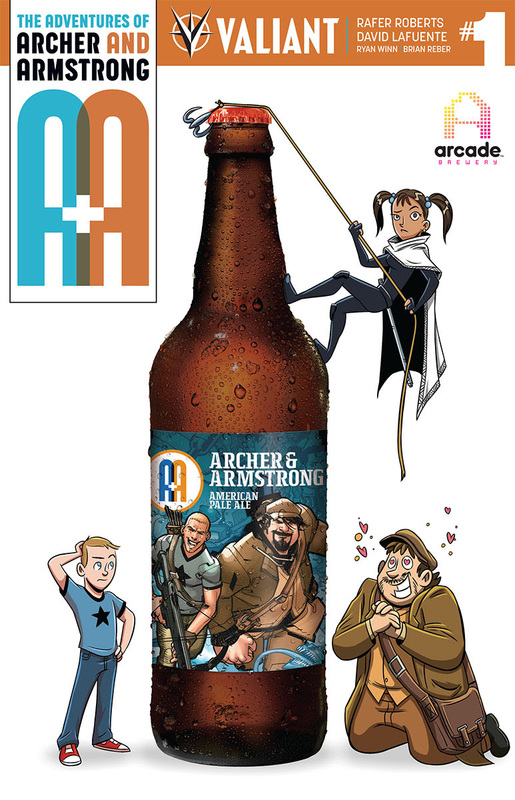 Clocking in at 7.0% alcohol by volume, Arcade’s first Valiant-inspired ale has all the fight of a long night out with Armstrong…but is slightly sweet enough to keep Archer in the game too! 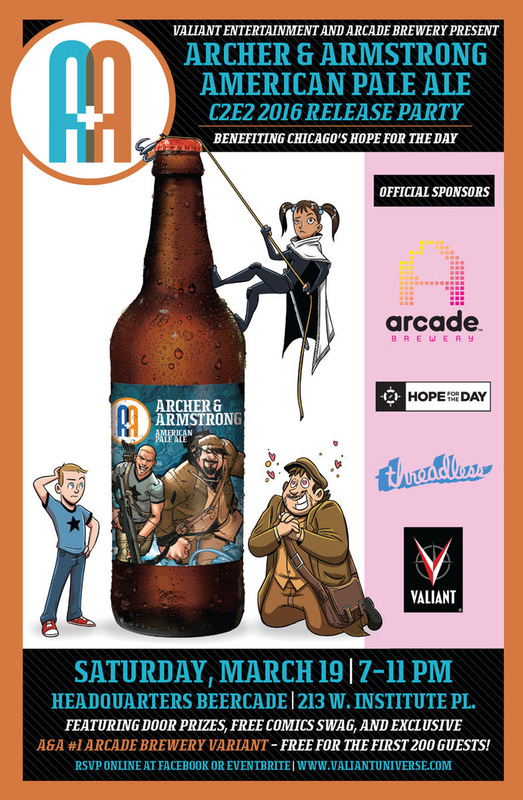 Featuring a label emblazoned with the artwork of Valiant-exclusive superstar David Lafuente, Arcade’s brand-new APA creation will make its official debut on Saturday, March 19th at the C2E2 2016: Archer & Armstrong American Pale Ale Release Party – from 7 to 11 pm CT at Headquarters Beercade’s River North location (213 W. Institute Pl., Chicago, IL 60610)! Portions of the proceeds from the night will be donated to Hope for the Day supporting their suicide prevention outreach and mental health education projects. RSVP online at Facebook or Eventbrite. Valiant Entertainment is a leading character-based entertainment company that owns the largest independent superhero universe in comics. With more than 81 million issues sold and a library of over 2,000 characters, including X-O Manowar, Bloodshot, Harbinger, Shadowman, Archer & Armstrong, and many more, Valiant is one of the most successful publishers in the history of the comic book medium. Today, the company’s characters continue to be forged in publishing, licensing, film, video games, and beyond. Valiant consistently produces some of the most critically acclaimed comics in the industry and has received numerous industry awards and accolades, including a Diamond Gem Award for Comic Book Publisher of the Year. In 2015, Valiant announced a multi-picture deal to bring Bloodshot and Harbinger to the big screen as feature films. Visit them online at ValiantUniverse.com. Hope For The Day’s vision is to bring communities together in order to shed light on the unfortunate topics of depression and suicide. We wish to share the deeply personal connection creativity can have in fostering an environment of positive change to the suffering. We view art and music as a highway to the heart; two things that have allowed humanity to express our emotions for milennia. We wish to reduce suicide rates while inspiring and empowering those who need help, to get help. Most importantly, we have the vision to use creative expression as a medium to educate communities while simultaneously striving to prevent suicide. You are Threadless. You make the ideas, you pick what we sell, you’re why we exist. Everything we do gives you, and all the creative minds in the world, more opportunities to make great art. We started printing on t-shirts and then we realized tons of products make great canvases. We seek out these canvases, so you can continue to make and pick the best art. The weird art. The geeky art. The beautiful art. And every time you buy from us, you’re supporting great art too. We love helping art unknowns become art totally-knowns, which is why every single one of our products carries an artist’s name. We support our artist community in every way possible, whether it be through our our annual creative awards, our commission-based award system, or simply by tweeting their name to the world. Lots of our artists have even gone on to start their own companies, and we believe that’s a success. We’re based in Chicago and have been since we opened our doors in 2000, and we couldn’t love our hometown more. 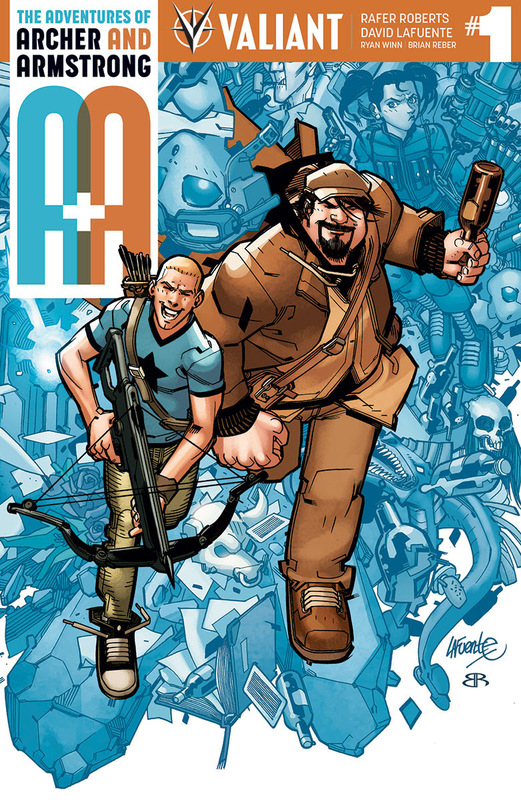 PLUS: READ 10 PAGES OF A&A: THE ADVENTURES OF ARCHER & ARMSTRONG #1 – On Sale March 16th!